The Ngaoundere three council is the most hotly contested area in the Adamawa with 7 political parties vying for the Mayoral seat. Observers say apart from the two dominant political parties in the council, many other smaller parties feel they stand a chance because 45% of the electorate are students of the University of Ngaoundere. Less than fifteen minutes on the main street of the University town of Dang, caravans of four different political parties had sped past. 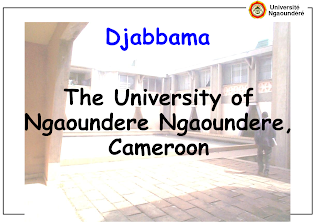 Dang the host council of the University of Ngaoundere, in Ngaoundere III municipality has the highest density of political parties campaigning in the Adamawa. If you are wondering like me, why 7 parties will be struggling to control this semi-rural, semi-urban locality, the answer we found out is what political analysts call here the University vote vs. the Rural vote. Hamatoukour Bobbo, the ELECAM communal office chief confirms that University students represent about 45 % of the voting public in Ngaoundere III, 7.500 of over 15.450 voters. The area is politically divided between the natives and university students. Unlike the rural people, politicians say the University students are not loyal to the NUDP or CPDM and want change, which they argue newer parties can bring. However no party can lay claim to a significant part of this electorate. He also claims that his blood relation with the natives plays in his favour in this race. At the roundabout leading off to the campus the UNIVERS party, competing only for the Ngaoundere III council in these elections was handing out fliers to students passing by. A political party which is only 3 years old and is depending heavily on the student voters to triumph in Ngaoundere III. This has created a situation in which all politicians are eyeing the two distinct groups of voters. While this political calculation sounds clever, the fact that the University students are on holidays now, and most may only return after Voting Day could be a game changer. University students traditionally resume school in October for a new academic year, this year they are expected to resume on September 23, one week before Election Day.